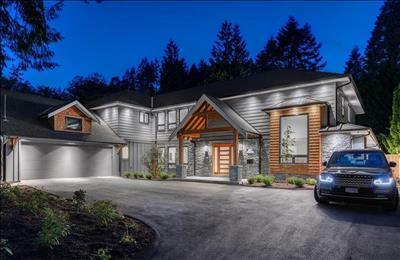 A brilliantly designed 6 bedroom, 4 and 1 half bathroom new family luxury home situated on a large private, child friendly, level property just steps to the Seymour River and Park. Meticulously built by the North Shore’s most respected 3’rd generation family of luxury builders. This beautifully appointed two level home offers over 4500 square feet of spacious living with large principal rooms and a wonderful walk out covered summer dining terrace with built in BBQ and gas fire. The home features an impressive display of luxury features including a sensational designer kitchen with large serving island and all top grade Sub Zero and Wolfe appliances including a large wine fridge. A separate den or study is ideally situated as is a private two bedroom suite situated on its own wing of the home with separate kitchen and laundry. Upstairs 4 spacious bedrooms including a large master suite with walk in dressing room and stunning 6 piece en suite bathroom. Many additional features of this home include beautiful engineered floors, radiant heating, air conditioning, integrated lighting, alarm system together with all designer fixtures and bathrooms throughout. All situated on a beautiful landscapes property with level driveway and two car garage.